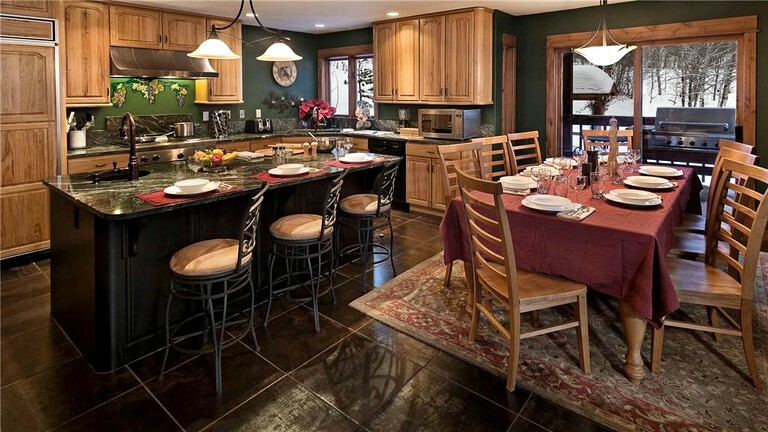 This luxurious vacation rental is located in Steamboat Springs, Colorado, and can accommodate up to 16 guests. There are six bedrooms, seven full bathrooms, and one half bathroom. The first four bedrooms each feature a comfortable queen-size bed. 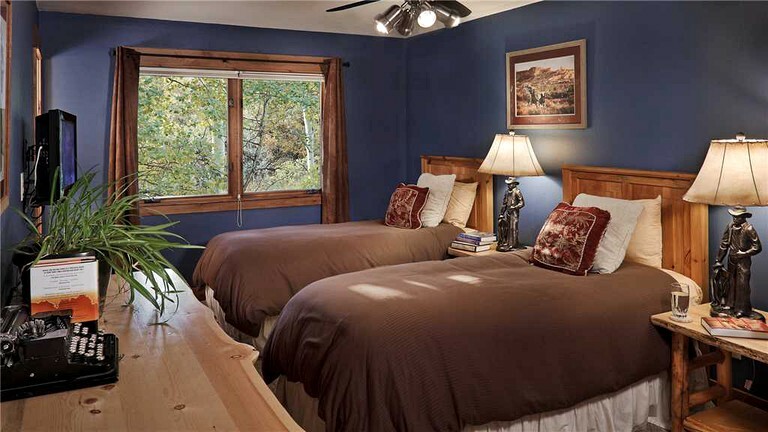 The fifth bedroom features a king-size bed, and the sixth bedroom can either be arranged with one king-size bed or with two extra large twin beds. In the seventh bedroom, guests will find a twin-over-full bunk bed. Each bedroom has its own ensuite bathroom. 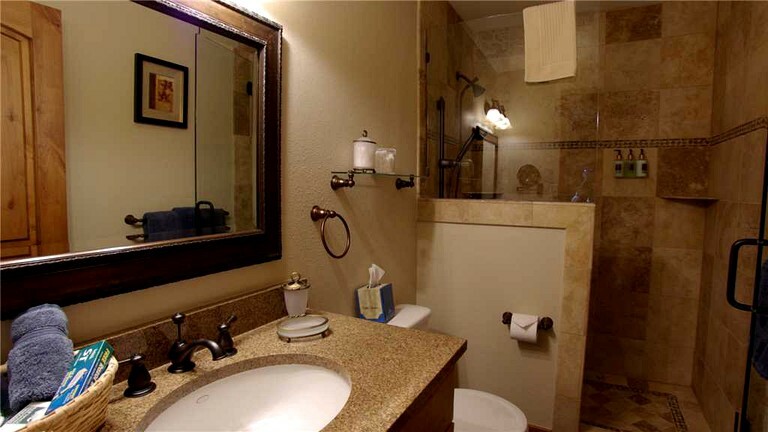 The master bathroom includes a toilet, a sink, a gas fireplace, a steam shower, and large bathtub. The additional bathrooms each have a toilet, a sink, and a shower or combination shower and bathtub. Linens and towels are provided. 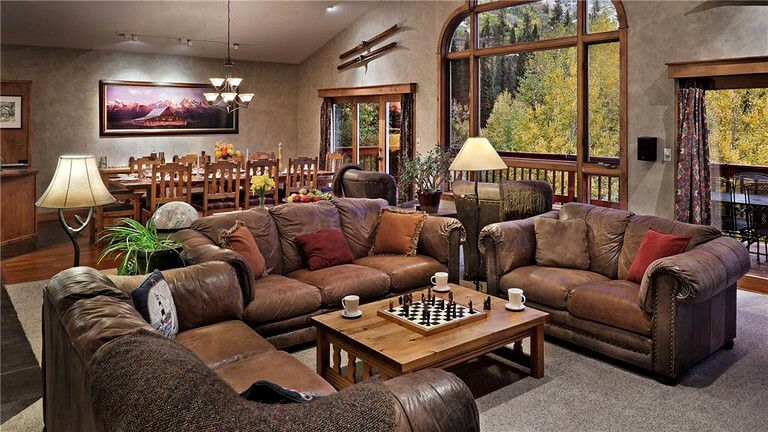 After a day on the ski slopes or hiking trails, guests can relax on the comfortable living room sofas in front of the fireplace. 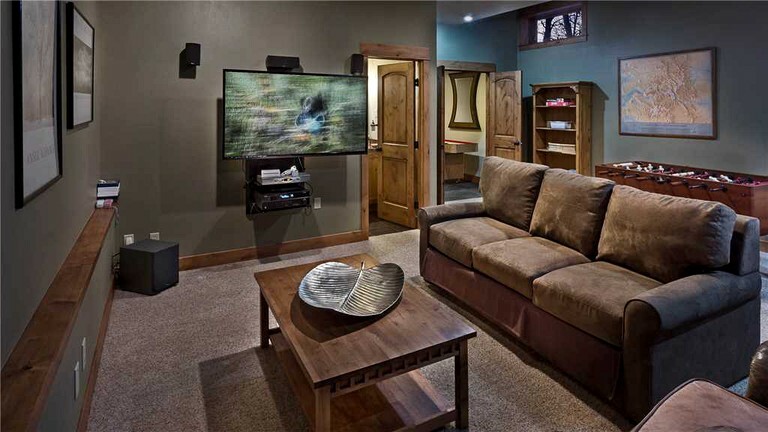 In the downstairs recreation room, guests will find a flat-screen television, more seating space, a Nintendo Wii game console, and a collection of books and games. The fully-equipped kitchen comes with a stove, a refrigerator, an oven, a microwave, a Nespresso coffee machine, and a dishwasher. Other amenities include Wi-Fi, heating, a washer and dryer, and onsite parking. This property features all the amenities guests will need for a comfortable and relaxing stay. 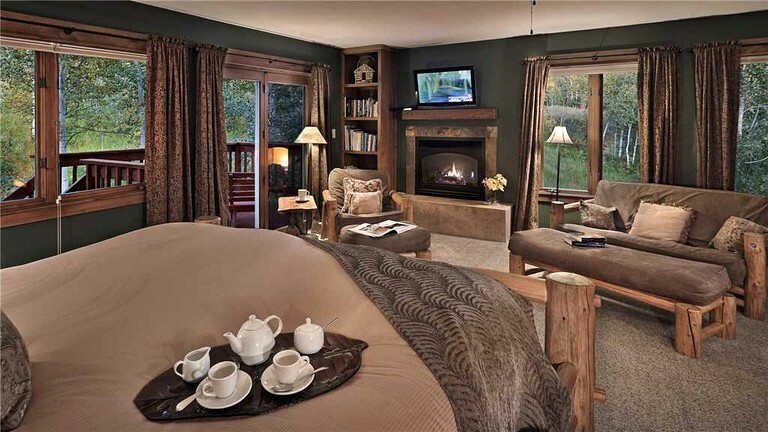 The living room features beautiful mountain views, three comfortable sofas, and a fireplace. For entertainment, guests will find a recreation room on the lower level complete with a 60-inch flat-screen LED smart TV with surround sound, a Nintendo Wii game console, and plenty of books and games. 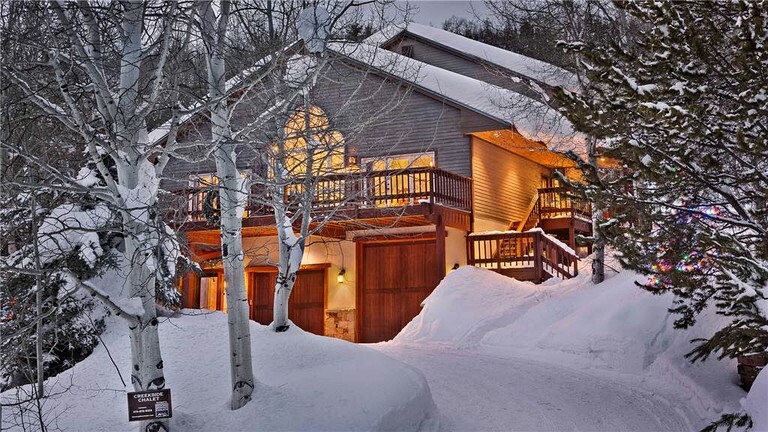 Outside, guests will find a deck overlooking the ski slopes with a barbecue and a luxurious eight-person hot tub, the perfect place for a relaxing soak after a day of skiing or hiking. Guests will also enjoy a private shuttle for transportation to the nearby ski lift in just one minute. Other amenities include Wi-Fi, a washer and dryer, heating, and bicycle storage. No matter what time of year guests choose to visit, there are a variety of exciting outdoor activities to choose from in and around Steamboat Springs. In the summer, popular activities include hiking on the beautiful nature trails nearby, horseback riding, zip-lining, and river rafting or kayaking. Nature lovers will especially enjoy exploring Medicine Bow-Routt National Forests, which is located just behind the property. 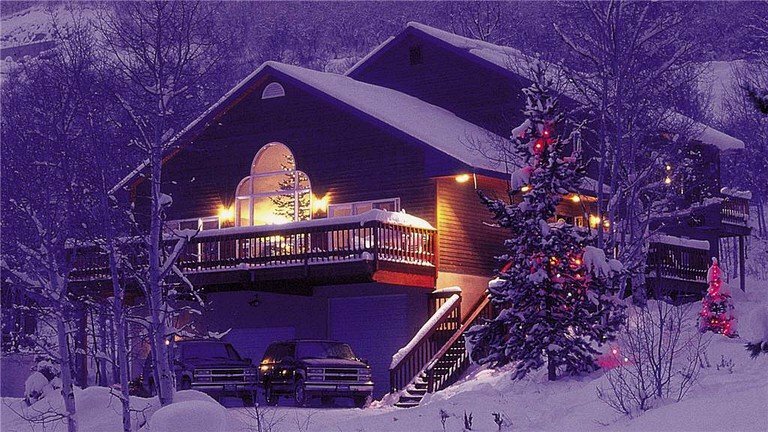 During the winter months, Steamboat Springs is a wonderful destination for skiing, snowmobiling, sledding, and sleigh rides. Family-friendly activities include riding the local Outlaw Mountain Coaster, booking a scenic gondola ride, or playing a round of mini golf. Those in need of some rest and relaxation can visit the natural hot springs at Strawberry Park, home to therapeutic thermal pools just seven miles from downtown Steamboat Springs. 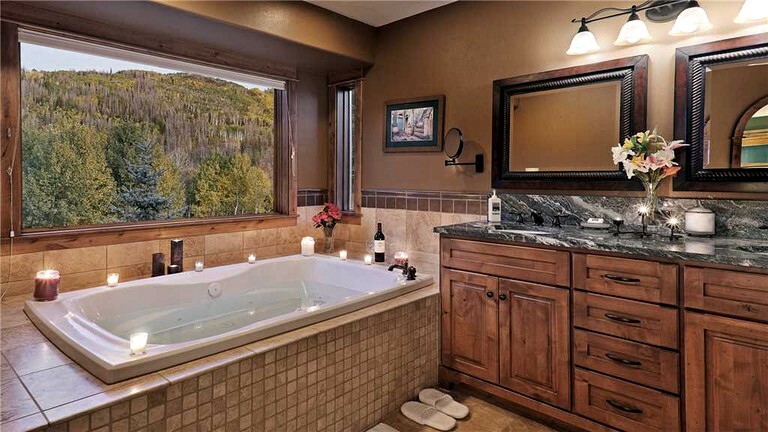 From relaxing in the hot tub to exploring the spectacular surrounding nature, there is no shortage of activities for guests to enjoy near this unique vacation rental. This is a pet-friendly property. Up to two pets are allowed per booking. Additional pet fees and pet cleaning fees apply.